Pilates is a system of exercises created by a German physical trainer named Joseph Pilates in the 1920s. He called his method “Contrology,” referring to the way in which the mind can control each specific muscle in the body, while focusing on the abdominals/core during each exercise. Growing up with asthma and rickets, Joseph Pilates managed to become very athletic through skiing, boxing, martial arts, and gymnastics. Convinced of the benefits of movement for the body, he developed a technique inspired by yoga, animal movements, and sports moves. After the First World War, he was asked to help injured soldiers. His idea was to attach springs to the posts at the top of the hospital beds to strengthen the injured. 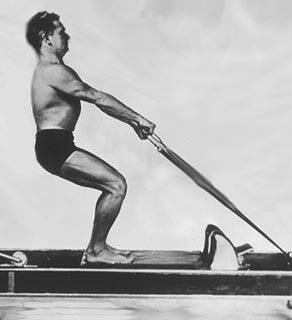 It was from this technique that the idea of the Reformer (the most popular Pilates instrument) was born. In the late 1920s, he immigrated to New York and opened his studio above the New York City Ballet. His method then quickly became popular among many dancers. This rise in popularity encouraged him to develop his Pilates method, based on his experiences and knowledge of the human body. Pilates rebalances the body’s muscles by focusing on the muscles of the core, which then aids in better postural alignment and spine support. Specific breathing, proper spine and joint alignment allow the body to execute exercises with precision, strengthening weak muscles and lengthening tight muscles. The Pilates repertoire contains a variety of 500 exercises based on the same 6 fundamental concepts: concentration, control, centring, precision, fluidity, and precision.